290 pages | 39 B/W Illus. This book provides an examination of the General Manager, which encompasses their roles as Strategist, Organizational Designer and Institutional Leader. Instead of exclusively focusing on economic aspect of General Management, this book explores the humanist perspective based on the conviction that maintaining high ethical standards is a pre-condition to healthy, long-term prosperity of firms and, more importantly, the development of employees. Bringing together a team of contributors from several prestigious business schools in Spain, Portugal, Central and South America, this book develops the field of General Management through academic thinking, research and practical experience in the form of original and relevant case studies from the perspective of Ibero-America business communities. After explaining the foundations of its call for humanist general management practices, the authors focus on themes inherent to Strategy and Organizing such as Sustainability, Business Model Innovation, Strategy in Emerging Markets, Strategic Alliances, Digital Strategy and Organizational Learning. They conclude by focusing on Institutional Leadership, and provide a fresh look at Boards of Directors, Risk Management, Family Businesses, Stakeholder Management and the work of CEOs. 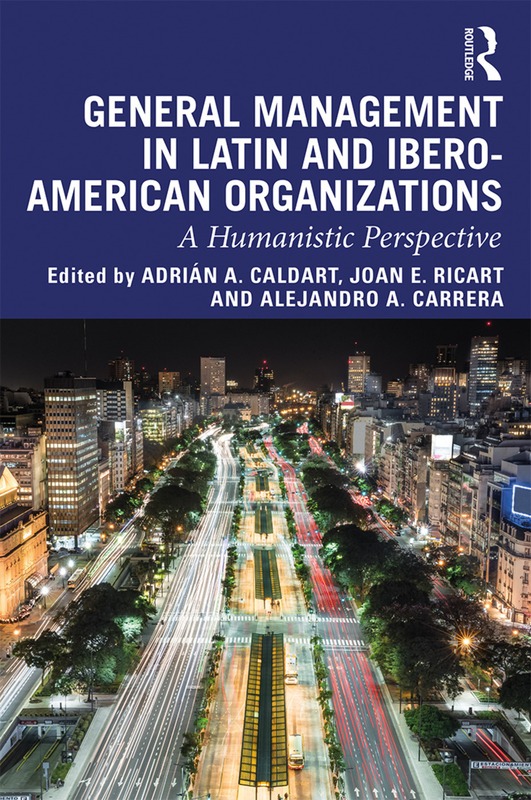 General Management in Latin and Ibero American Organizations is an invaluable resource that will be of great interest to practitioners and students in the field of International Business, Management, HRD, Organization Studies, Strategy in Emerging Markets, Leadership and Corporate Governance. Joan E. Ricart, Fellow of the SMS and EURAM, is the Carl Schrøder Professor of Strategic Management at the IESE Business School where he was, from 1993 to 2016, Chairman of the Strategic Management Department, University of Navarra. He was the Founding president of the European Academy of Management (EURAM), President of the Strategic Management Society (SMS), and Vice-president of the Iberoamerican Academy of Management. He was the academic director of the EIASM and member of the research committee of the EFMD. Joan E. Ricart holds a Ph.D in Managerial Economics, Northwestern University; Ph.D. in Industrial Engineering, Universitat Politècnica de Catalunya; and Ph.D. in Economics and Business Administration, Universitat Autònoma de Barcelona. Adrián A. Caldart is a Senior Lecturer of Strategic Management and the Academic Director of the Food & Beverage Industry Meetings at IESE Business School (Barcelona, Madrid, New York, Munich and São Paulo). He is also Professor of Strategic Management at AESE Business School (Lisbon and Porto, Portugal), where he is Director of the Business Policy Academic Area and President of the Academic Council and of the EMBA Committee. His research interests include Corporate-level Strategy, International Strategy and The Work of the CEO, topics in which he has published several academic articles, book chapters and teaching materials, including over 20 teaching case studies. He co-authored the book "The Dynamics of Strategy. Mastering Strategic Landscapes of the firm". Alejandro A. Carrera is Professor of Business Policy at IAE Business School. He is Founder, Chair & Director of the PWC Cátedra de Gobierno de las Organizaciones since 2009. He was from 1986 to 2006, Chairman of the Business Policy departmentat the IAE Business School, Austral University. From 2006 to 2012 professor Carrera was board member at this institution, fulfilling the role of vice-dean from 2008 to 2012. His research interests include Corporate Governance, Entrepreneurship and the Work of the CEO, topics in which he has published several academic articles, book chapters and teaching materials, including over 30 teaching case studies.